Scotland’s soft, determined pro-Europeanism, just like that of Northern Ireland, is seen by Brexit England as just another reason to hold entire nations in contempt. Image: SNP MPs walk out of Prime Ministers' Questions last week. Credit: PA Images. Brexit isn’t going well. Two years after the referendum vote for the UK to leave the EU there is still no agreed plan on what kind of Brexit the UK Government wants. Theresa May’s administration staggers from day to day - too weak to dare to define what it stands for - facing regular crises, critical parliamentary votes and defeats. 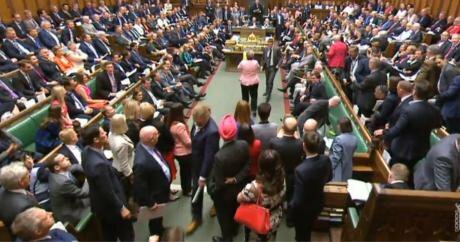 Last week, after Scottish affairs was reduced to 15 minutes in the House of Commons, the SNP walked out during Prime Minister’s Questions, resulting in much media comment and headlines. But as the immediate shockwaves die down - does any of this have any longer term impact? The most recent events brought forth in a politics deeply divided about Brexit, let alone different views on Scottish independence, very differing accounts. One school of thought used the above events to opine on how the UK really works. Step forth Tim Shipman, Political Editor of the ‘Sunday Times’, who stated: ‘I’m not clear why Scotland should be regarded as any more important than, say, Manchester?’ Somehow Shipman wasn’t really looking for a crash course in the basic make-up of the UK and its multiple historic unions. Some wanted to use the stramash to tell the Scots to shut up or to poke fun at a ridiculous want to be different. That is a view which ran through much right-wing commentary, and which underlines the threadbare nature of the unionism which proclaims its love of the union but at the same time has got into the habit of disrespecting one of the key members. For example, ‘SNP Stunt Backfires’ said the ‘Scottish Daily Mail’, ‘’Stop Waging War!’ – SNP told to ‘move on’ from Brexit antic after business backlash’ said the ‘Scottish Daily Express’. Others drag out of the cobwebs vague references to the idea of federalism, which really only amount to mood music and diversionary tactics. The idea of federalism - when it has been serially raised since 2014 and is never accompanied by a plan - is a bit rich. And in the week the author of ‘the Vow’, Murray Foote, ex-editor of the ‘Daily Record’, came out for independence, less and less plausible. Then there is the pro-independence take. Iain Macwhirter in the ‘Sunday Herald’ talked of Theresa May’s Tory Government disrespect of Scotland producing ‘a new unitary state Britain’, a phrase Macwhirter has used before and clearly thinks describes the new constitutional realities being created by Brexit. But last weekend he went much further, describing the Westminster attitude towards devolution as one which represented ‘a kind of colonial authority over the Scottish Parliament’ - which is a bit hyperbolic. We are dealing with big issues, and therefore must try and reflect the seriousness of them and the consequences that then emerge. For one there is the issue of Sewel motions - named after Labour Lord Sewel (before the tabloid scandal involving the coke and hookers) - whose proper name is Legislative Consent Motions. These are a typical British fudge: dreamt up as a convention with no legal standing which allows the Scottish Parliament to vote to give permission to Westminster to legislate in devolved areas. The Scottish Parliament has, in its near twenty years of existence, only voted on two occasions to deny Westminster consent – one of which has been over Brexit. Thus the argument that the SNP have been continually looking to fight constitutional battles and aid a culture of grievance isn’t borne out by their actions. The Welsh Assembly has over the course actually been more assertive and withheld consent on more occasions. Secondly, comparisons between the SNP and Irish Nationalists are not helpful. This says a lot about those who are not committed to the Westminster order are seen by the establishment. Pro-union voices who heap praise on Charles Parnell, leader of the Irish Nationalists, and compare him favourably to Ian Blackford, SNP Westminster leader or any other senior Nationalist, have to be taken with a pinch of salt. There is a long tradition of praising yesterday’s rebels and doing so to denigrate and dismiss today’s rebels. Thirdly, the above set of events aren’t quite the simple end of devolution some portray. It is much more complex and unpredictable. Scotland has clearly outgrown the devolution settlement, while England never really understood it or showed that much interest in the finer details. ‘Grace and favour devolution’ - as ‘Political Betting’ writer Alastair Meeks described it this weekend - will not be very acceptable for very long for most of Scotland. Fourthly, some have stated that all this means that Scottish independence is ‘inevitable’. That seems a very big word which should be rarely written about politics. But in the course of the last week the fragmentation and decoupling of the United Kingdom has continued apace. This isn’t a set of events which began with a SNP walkout or even with Brexit. It didn’t even begin when the SNP won office in 2007 or the Scottish Parliament was established in 1999. To give one example, the thinker Tom Nairn penned his classic, ‘The Break-Up of Britain’ in 1977 about the dissolution of a British-wide politics, the rise of ‘four nation’ nationalism, and the impact of the critical European dimension. Nairn understood that one of the driving dimensions in this, as well as Scottish self-government, was the strange case of England: a land which still had a hangover about Empire and reservations about Europe. So it has proven with Brexit. There is a long tail to how we got to this sorry pass which predates Brexit and even devolution, New Labour and Thatcherism. We are dealing with deep-rooted powerful forces here, such as the long-term neglect of the North - and how the City of London and finance capital have ‘crowded out’ other more socially useful productive parts of the economy. There is in Brexit-supporting circles incomprehension at the pro-European state of Scottish politics, public opinion, and even independence. Lloyd Evans characterises the latter as Scotland handing itself over ‘to a continental super-state run by two unelected gravy-guzzlers from Luxembourg and Poland.’ Such sentiments tell us more about the worldview of those saying them than anything about Scotland. But critically, Scotland’s soft, determined pro-Europeanism, just like that of Northern Ireland, is seen as another reason by Brexit England to hold entire nations in contempt. Even more seriously, Westminster just has a tonal deafness with regard to Scotland. No one senior in the government thought that two years into Brexit and a taught European Union (Withdrawal) Bill a fifteen-minute non-debate might be a tad insensitive. This underlines the case that one of the original arguments for devolution was how badly Westminster did accountability and Scottish affairs. Twenty years on this state of affairs has denigrated to farce and being indefensible. It is commonplace to see Brexit as an English phenomenon, but in truth it is only a very partial version of England: a perspective of right-wing populists mixing idealists, ideologues and chancers, who have hitched on a constituency of forgotten England and promised them that the existing way of things would be shaken to the ground. We have to start talking about English nationalism, and maybe most urgently, the English left and Labour need to start talking about those things. When I tweeted polling from Michael Ashcroft which showed that Leave voters prioritised Brexit (63%) ahead of maintaining the union (27%) as proof of English nationalism sentiment behind Brexit, former Labour MP John Denham replied: ‘Blaming ‘English nationalism’ is a way to demonising the English rather than engaging with the English and Englishness.’ I then invited him to agree it was an expression of a certain version of English nationalism and he replied that ‘English nationalism’ was a ‘misleading idea’, without answering why England would be the one country in the world without a nationalism. This is part of an English exceptionalism in the extreme which has contributed to this mess. For those who still want to reverse Brexit, such as a small band of Labour MPs, they need to take into account the wider currents which produced this revolt and understand that however unpleasant they find it things cannot go back to how they were pre-June 2016. The same is true for us living in Scotland. There is no return to the quiet reassuring times before the twin peaks of our two referendum votes. More than that, we face the challenge of living on an island with a dominant version of Britain that the majority of Scots find repugnant and that does not appear to contain any humanity or enlightenment. Add to that mix Brexit, and the insensitivities towards Scotland that it brings, and it follows that this union looks weaker and more in doubt than it ever has been. But we should in this not pretend that Brexit is the cause of our discontent for it is merely the latest symptom of a longer and profound story. We may not yet be on a ‘motorway without exit’ to use Labour rebel Tam Dalyell’s memorable phrase, but the exit points to avoid the final destination of independence are fast being exhausted. And some of the main facilitators of this in the here and now, building on that long decline, are not north of the border, but to be found in continual Westminster indifference and insensitivity and in the narrow Brexit dogma from such English nationalists as Jacob Rees-Mogg, Ian Liddell-Grainger and Nadine Dorries.